When Has Your Meal Had A Story Like This? 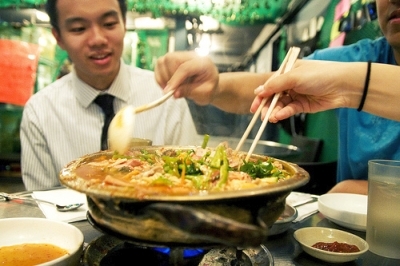 So much more than the “leeks, onions, garlic, and other greens” that swim amidst the odd presence of sliced hotdogs and Spam, one of Korea’s favorite dishes, Budae Jjigae, is a stew with a backstory not likely associated with most meals, as TheExpeditioner.com’s own Jon Wick finds out in this piece. So where can you go to try the best? Head north from Seoul to Uijeongbu Odeng Shik-dang and get in line to visit what many Koreans consider to be the best joint serving this odd concoction. I have to admit, this makes my impending dinner of ramen from a bag look kind of lame now.